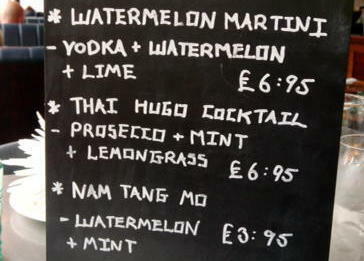 Based on the popular beach sold Nam tang Mo fresh watermelon juice we haveour Watermelon Martini with Vodka, fresh lime and a hint of mint. And for a light Aperitif or easily matched to our menu dishes the dangerously quaffable Thai Hugo a mix of Prosecco, Bashed lemongrass, lime,and elderflower elegance in a glass. If your teetotaling or driving, then don’t settle for the hum drum, try our freshly blended watermelon juice, or lychee specials. Either way there is always something fresh tasty and different at Chilli Banana.